Today I wanted to review for you my new favourite brush that I have been completely in love with since I received it! I received this brush from Sigma a few months ago so I've had a fair bit of use of it. Firstly I love how neat and simple the brush is, it doesn't try to stand out too much against other brushes, I like the simplicity of the contrasting black and silver design. 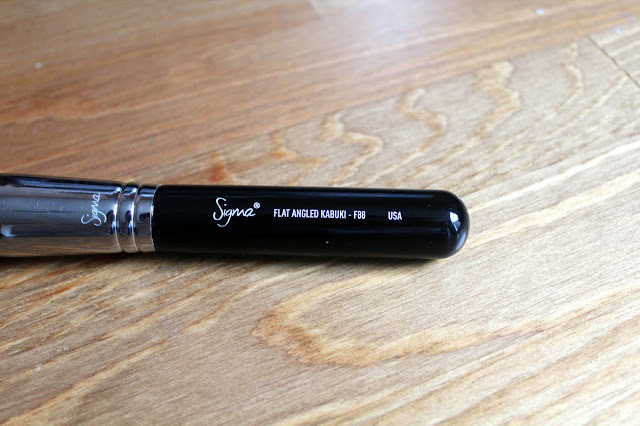 Sigma is one of the brands that I like for brush's because they use synthetic bristle for their brushes, this means that they are less prone to damage, their easy to clean and they are extremely soft which is perfect for the application of liquid foundation, which is what I use it for. I love how well this brush glides my foundation on, giving me a good even base coverage and as it has a angled head the F88 makes it easier to get to all areas of my face evenly as well as this because the brush is quite wide it doesn't take me as long to apply my foundation as the brush covers large areas very quickly. Overall I really enjoy this brush and have used it happily since receiving it, I didn't think that I would ever use a foundation brush that wasn't my Real Techniques Buffing Brush but I guess I was wrong! 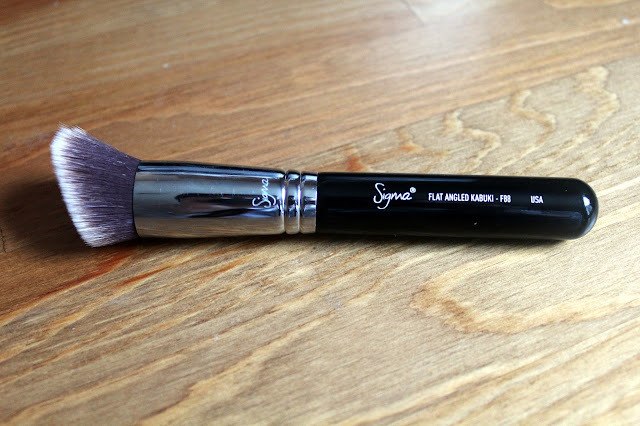 I would truly recommend this brush for everyone to try, it is retailed at $18 at sigmabeauty.com which is slightly more expensive but I would say it's worth it, I know I will be checking out more of their brushes in the near future to try out! Hope you guys found this review helpful, if you have any post requests eg. more beauty review/more fashion posts then just comment below and I will add it to my blog post list! * posts marked with this sign mean that a/the product was giving to me by a brand and not bought by myself , this in no way affects my opinions or views on the product, I will be 100% honest with my review of it.